What do you get when you cross the film noir classic Double Indemnity with whimsy and pastels? 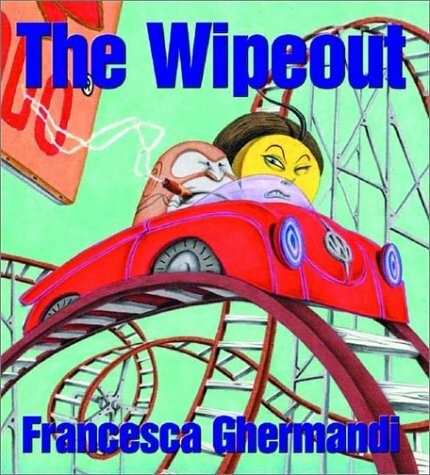 You get The Wipeout, Italian writer/illustrator Francesca Ghermandi’s obscure little masterpiece. That’s what. Set in some artless dystopian city in some familiar but other dimension, but rendered in a cheerful, children’s book style, The Wipeout transpires on tilt. Something is amiss, and you know it the second you start reading. Jim Tartaglia, our protagonist/patsy, is living a perfectly humdrum life in a loveless marriage to a bitter, balding, wife. Though visibly discouraged, Jim accepts that his only joy will be derived from his work as a chemist with a well known manufacturer of cleaning products. He’s on the brink of unprecedented success in cleaning product development, in fact, when along comes Miss Virgin Prunes, pill head/femme fatale, whose damsel in distress act will drive Jim to near atrocity and insanity. But that’s obvious, Dear Reader. You’ll have to endure the tangled web to get the bottom of the story. Rest assured, the descent is enjoyable. Ghermandi’s wry humor reveals itself throughout, as does her firm grasp of the noir genre. The cinematography is dead on, which is fun in itself, but the cast of characters in their cheeky childlike literality, make The Wipeout a total treat. A treat not to be taken lightly, though. As with those bizarro carnival funhouses it evokes, The Wipeout is not all fun and games. Good art carries a message, and Ghermandi is recommending both a closer look and a wider lens. Evil is ubiquitous and horrifically nonchalant. We are all vulnerable, and capable.